In the Monet pond, the leaves of the Gardens’ favorite lotus Nelumbo nucifera 'Mrs. Perry D. Slocum' sporting plate-like water resistant leaves. In the background is an exciting graffiti artist’s mural (Lady Pink) and reflection. 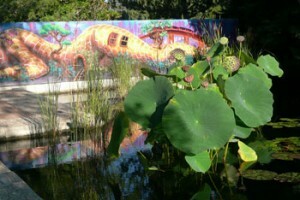 The colorful murals are part of the Gardens’ popular "Urban Nature" exhibit.